Snooze Gmail messages to save them for a later time. Snooze Gmail emails for a later time with Boomerang. Deal with messages when you need them, and prevent any from falling through the cracks. You can snooze any message that you want to follow-up with later, whether you received it or sent it, all without leaving your browser or Gmail! Just downloaded Boomerang for Gmail! I should have done this a long time ago! Productivity win! Boomerang has let users snooze emails in Gmail since before people called it "snoozing!" 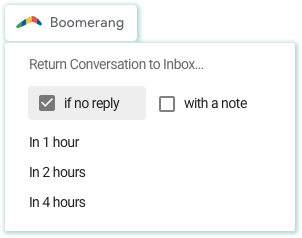 Once installed, you can save an email for later by simply clicking the Boomerang button at the top of a message, and choosing the time you want it to return to your inbox. Your message will dissapear, uncluttering your inbox, and return at the time you chose. Want to snooze a message so it returns to your inbox in a few days, but only if there's no response? We've got that feature (and got you covered). Following-up on emails that don't get responses has never been easier!